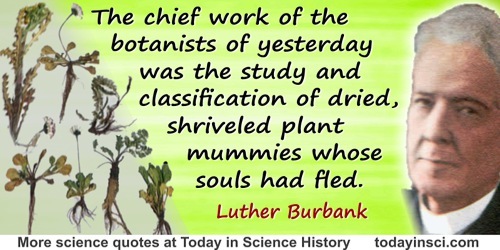 American naturalist and horticulturist who was a pioneer of plant breeding. At age 21, he produced the the Burbank potato. Thus he began a 55 year career, prodigiously producing useful varieties of fruits, flowers, vegetables, grains, and grasses. As quoted in Forbes (1948). 42. 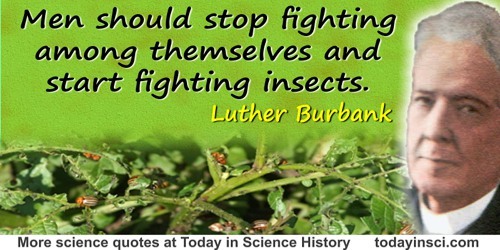 Men should stop fighting among themselves and start fighting insects. In George Seldes, The Great Quotations (1960), 125. No occupation requires more accuracy, foresight and skill than does scientific plant or animal breeding. From Paper read at the Annual Meeting of the American Breeders’ Association, at Columbia, Mo. (5-8 January 1909). In 'Another Mode of Species Forming', Popular Science Monthly (Sep 1909), 75, 265. Only a few years ago, it was generally supposed that by crossing two somewhat different species or varieties a mongrel might be produced which might, or more likely might not, surpass its parents. The fact that crossing was only the first step and that selection from the numerous variations secured in the second and a few succeeding generations was the real work of new plant creation had never been appreciated; and to-day its significance is not fully understood either by breeders or even by many scientific investigators along these very lines. From Paper read at the Annual Meeting of the American Breeders’ Association, at Columbia, Mo. (5-8 January 1909). In 'Another Mode of Species Forming', Popular Science Monthly (Sep 1909), 75, 264-265. Plant breeding to be successful must be conducted like architecture. Definite plans must be carefully laid for the proposed creation; suitable materials selected with judgment, and these must he securely placed in their proper order and position. 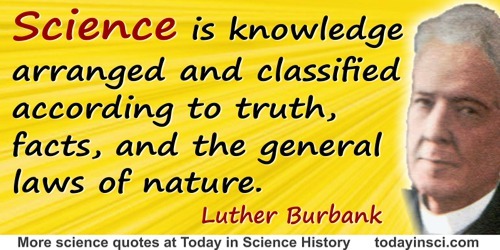 Science is knowledge arranged and classified according to truth, facts, and the general laws of nature. Interview in San Francisco Bulletin (22 Jan 1926). As cited in Michael C. and Linda Rose Thomsett, A Speaker's Treasury of Quotations: Maxims, Witticisms and Quips for Speeches and Presentations (2009), 102-103. Also in 'Science and Civilization', Prescott Evening Courier (3 Nov 1925), 6. The chief work of the botanists of yesterday was the study and classification of dried, shriveled plant mummies whose souls had fled. Quoted in Dr. D. M. Brooks, The Necessity of Atheism (1933), 341. Those who take refuge behind theological barbed wire fences, quite often wish they could have more freedom of thought, but fear the change to the great ocean of truth as they would a cold bath. 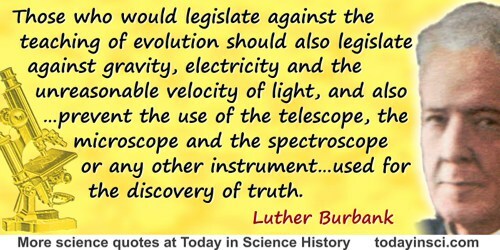 Those who would legislate against the teaching of evolution should also legislate against gravity, electricity and the unreasonable velocity of light, and also should introduce a clause to prevent the use of the telescope, the microscope and the spectroscope or any other instrument of precision which may in the future be invented, constructed or used for the discovery of truth. In 'Science and Civilization', Prescott Evening Courier (3 Nov 1925), 6. 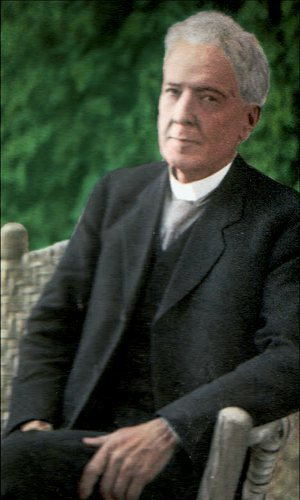 7 Mar - short biography, births, deaths and events on date of Burbank's birth. 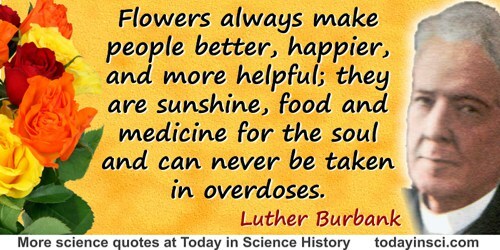 New Creations in Plant Life: An Authoritative Account of the Life and Work of Luther Burbank, by W. S. Harwood. - book suggestion.